A mineral makeup range that treats your skin with beneficial natural ingredients, rich colours and silky textures. Youngblood Mineral Cosmetics is formulated with 100% pure minerals – it is completely free of talc, perfume and chemical fillers. 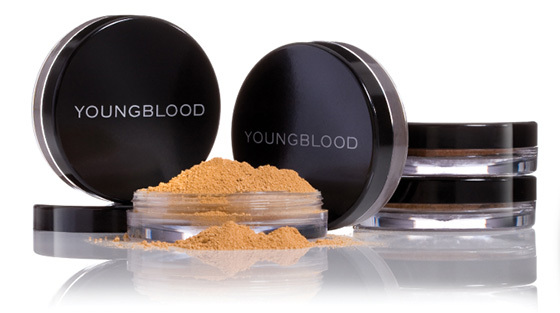 Youngblood Mineral Makeup provides light-weight, luminous coverage without clogging your pores or causing irritation. It is ideal for sensitive or reactive skin. Create a naturally flawless complexion with this ultra-fine, luxurious mineral powder that works as a foundation, concealer and powder! It’s lightweight, silky formula will help you achieve a smooth, buildable coverage and a soft, radiant finish – without any shimmer. Liquid Mineral Foundation contains Youngblood’s Deep Sea Hydrating Complex to rehydrate dry, lifeless skin for a healthy radiance! It’s unique blend of reduced deep sea water, botanicals and ocean minerals soothes the skin to create a soft, silky, pore-free appearance that will wear for hours!